Major League Baseball’s Texas Rangers share a lot in common with the Atlanta Braves in ballpark development, and those ties now extend to marketing the facility. The Rangers have hired Van Wagner Sports & Entertainment to assist with selling premium seats and founding partners for Globe Life Field in Arlington, the team’s new $1.1 billion stadium opening in 2020. Van Wagner filled a similar role with the Braves at SunTrust Park, which opened in 2017 with 32 suites and about 4,000 club seats. In Arlington, the agency will help the Rangers sell 80 suites and 3,000 club seats at the new retractable-roof ballpark. For the suites alone, it’s a decrease of more than 40 percent compared with the 126 suites at the Rangers’ current home, Globe Life Park. “The key is we’re bringing our entire suite of revenue-focused consultation to the Rangers — premium planning and sales, founding partners and physical design,” said Chris Allphin, Van Wagner’s senior vice president of team and venue services. Evan Gitomer, Van Wagner’s vice president of premium ticketing, is already in Arlington, working closely with the Rangers as they prepare to open a 7,000-square-foot preview center behind the right-field stands at Globe Life Park. The center opens in early October and is a retrofit of the old Hall of Fame Club. It was previously used for pregame hospitality and corporate meetings on days when games weren’t being played, said Joe Januszewski, the team’s executive vice president and chief revenue and marketing officer. Downstream, teaming with HKS, designed the preview center and Mobile Media Content developed the 3D seating views. Channel 1 of Toronto is responsible for the presentation format. Manhattan Construction, the new ballpark’s general contractor, is building the center, which is on two levels. The Rangers will staff the preview center and Gitomer will fill the role of general manager, Allphin said. In addition, Kyle Folts, vice president of Van Wagner Sports & Entertainment Insights, Van Wagner’s data analytics group, will be principally involved from the firm’s New York office. Folts worked on SunTrust Park as well as U.S. Bank Stadium in Minneapolis, another Van Wagner client. The Rangers’ current facility opened in 1994, and many MLB parks built during that era featured 100 or more suites. Times have changed, and SunTrust Park and Marlins Park (which opened in 2012) both have fewer than 40 suites. In Dallas-Fort Worth, there are fewer suites at the new park, but there’s still a big appetite for that high-end experience, Januszewski said. 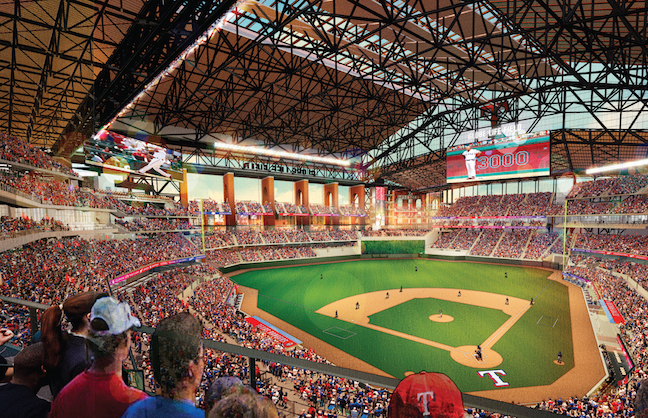 A few years ago, CSL International completed some pricing studies for the new ballpark in conjunction with the stadium’s architect, HKS, and the Rangers’ in-house CRM division. The Rangers also talked with the Braves several times about their premium seat mix before SunTrust Park opened its doors. Globe Life Field’s most exclusive premium product is the 13 Home Plate Field Suites, situated at field level with seven to nine seats. The Cleveland Indians, Anaheim Angels and Arizona Diamondbacks have similar suites at their parks. In Arlington, the Home Plate Field Suites are 40 feet from the catcher, the shortest distance in MLB for premium seats behind home plate, Januszewski said. Sixty-seven suites, a mix of long-term and nightly rental units, are on the upper suite level, which is about the same distance from the field as the lower suite level at Globe Life Park, he said. As of this week, the Rangers were still defining suite prices before they start contacting existing customers. Januszewski declined to provide numbers for how much suites cost at their current park. In Atlanta, the 10 suites closest to home plate at SunTrust Park cost $500,000 a season, which includes food and drink. Most of the premium seats at Globe Life Field will have an all-inclusive component, Januszewski said, which is reflected in the higher cost for the suites in Atlanta. Both teams have Delaware North Sportservice as their concessionaire. Shawn Mattox, Sportservice’s GM in Atlanta, was previously stationed at the Rangers’ park. Apart from the suites, the Rangers are building a four-top table product encompassing 320 total seats. They’re situated between the bases and in center field above the batter’s eye. At SunTrust Park, the 90-plus terrace tables midlevel behind home plate, a similar product, sold out in two months. When the stadium opened last season, those seats cost $130 and $113 a person per game as a season ticket. All told, there will be five premium lounges at Globe Life Field, compared with two indoor clubs at the current park.